Best Season Ever (Katie Woo Series). 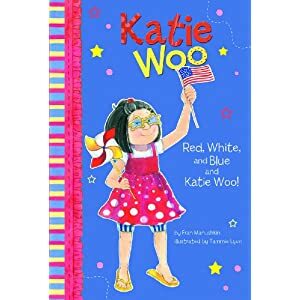 Red, White, and Blue and Katie Woo! (Katie Woo Series). Boo, Katie Woo! (Katie Woo Series). By Fran Manushkin. Illustrated by Tammie Lyon. Picture Window/Capstone, 32 pp., $19.99 each. Ages 5-8. Best line: A party idea in the supplemental material for Boo, Katie Woo! : Make an “Icy Hand” for a Halloween punch by filling a non-powdered latex glove with water, freezing it, and removing the glove before floating it in the bowl. Worst line: No. 1: A picture of Pedro heading a soccer ball and the words, “He backed up to hit the ball with his head” in Red, White, and Blue and Katie Woo!. Katie is 6 years old, and her friends are about the same age. American Youth Soccer discourages children under the age of 10 from heading, and U.S. leagues generally don’t teach it before then. No. 2: A picture of Katie standing outdoors in a sleeveless dress in a snowstorm on the cover of Best Season Ever. This seems to be a fantasy when the other pictures are realistic, and it sends a confusing sign about what the book contains. No. 3: These books don’t explain why they phoneticize the Chinese surname “Wu” to “Woo.” Would a two-letter word have been harder for children to grasp than a 3-letter one? Consider reading instead or or in addition these books: The “Henry and Mudge” early-reader series by Cynthia Ryant and Suçie Stevenson, which includes Henry and Mudge in the Sparkle Days. You can also follow Jan (@janiceharayda) on Twitter at www.twitter.com/janiceharayda. John Updike celebrates the Fourth in the spirited children’s poem “July,” which begins: “Bang-bang! Ka-boom! / We celebrate / Our national / Independence date.” The poem is one of 12, one for each month, collected in A Child’s Calendar (Holiday House, 32 pages, $17.95 hardcover, $6.95 paperback, ages 4–8). Beautifully illustrated by Trina Schart Hyman, this picture book won a Caldecott Honor for its images of four seasons in the life of members of an interracial New England family and their friends. Don’t miss Updike tending the barbecue grill in the full-page picture next to the poem. Have all the veterans on parade today made you want to know more about members of the military and their families? Pick up Jim Sheeler’s Final Salute: A Story of Unfinished Lives (Penguin, $25.95) www.jimsheeler.com, a moving portrait of a Marine casualty notification officer and the bereaved families he tried to comfort. Based on a Pulitzer Prize-winning series for the Rocky Mountain News, this is journalism at its finest, enriched by wonderful photos by Todd Heisler and others. A review of Final Salute appeared on this site on June 20, 2008 www.oneminutebookreviews.wordpress.com/2008/06/20/. George M. Cohan claimed that he, like the Yankee Doodle Boy of his famous song, was born on the Fourth of July in 1878. But it true? In a poorly sourced article on Cohan, Wikipedia says that the composer was born on July 3, 1878. Other sources disagree with the online encyclopedia. To hear a 1905 audio recording of “Yankee Doodle Boy” sung by tenor Billy Murray, including verses rarely heard today, click on the following link (where you will hear the lines at the top of this post about 40 seconds into the song): www.firstworldwar.com/audio/Billy%20Murray%20-%20Yankee%20Doodle%20Boy.mp3. Cohan wrote “Yankee Doodle Boy” for the 1904 Broadway musical, Little Johnny Jones. You can also hear Cohan’s “Over There” for free in three recordings on the site www.firstworldwar.com/audio/overthere.htm site, including a English-French version by Enrico Caruso. To listen to the Caruso or another “Over There,” you will have to make another click on the site to select which version you want to hear.